The democratically elected student’s Union is entrusted with all the extra curricular activities of the students, which are performed under the able guidance of the Professor-in-Charge. To monitor the advancement of learning. To develop sense of social service, corporate life and patriotism through community service. To inculcate ethical and moral values in students. To prepare the students for entering into a bright career, meeting the social, economic and other challenges and contributing to peace, human unity and universal welfare. To maintain a healthy relationship between students, faculty and non-teaching staff and to promote an academic environment in the college premises. To organize cultural programmes & cultural competitions in view of developing a cultural environment in and around the college campus. To arrange Debate, Seminar and Extempore speeches on various topics to make the students reasonable in thinking as well as behaving. To publish Wall Magazine and Annual Magazine to enhance the creative faculty of students’ mind. To organize Indoor and outdoor Games for the students so that they can explore themselves. To run Students’ Aid Fund in view of ensuing financially weak students to continue studies. To keep the Grievance Redressal Cell activated all the time to minimize the problems cropped up among the students. To arrange Educational Tour to provide the students chances for cultural exchange and enhancement of knowledge. To keep constant vigil on the welfare and development of the students. This is one of the most important department of the Students’ Union. This department conducts its round the year activities keeping in mind the cultural tradition of our beloved country. This department organizes various cultural competitions throughout the year like Recitation competition, Dance Competition, Sangeet Competition, Tabla Lahar Competition, Rangoli Competition etc. Throughout the year this department encourages the participation of the students in Inter collegiate Cultural Competition at the affiliating Universities. Students of our College generally do very well in this competition and thereby make the institution proud. Under the supervision of a Professor-in-charge the members of the departmental Sub-Committee regularly bring outWall-Magazine at regular interval to suit the mood of seasonal flavour. This department publishes an Annual Magazine, ‘Amitrakshar’ to which students both of the current year as well as of the past years, and the teaching staff contribute their original compositions. This magazine maintains a standard of its own. This department mainly takes care of the arrangement of various competition regarding indoor games for the students. The teaching and non-teaching staff of our College jointly participate in these competitions. This department is in charge of arrangement for various competition on outdoor games for the students. The teaching and non-teaching staff of our College jointly participate in these competitions too. Throughout the year this department encourages the participation of the students in Intercollegiate Athletics Meet (Non-Govt.) and University Level Athletics Meet at the affiliating Universities. Students of our college generally do very well in this competition and thereby make the institution proud. The department also arranges the Inter Class Football and Volleyball Competition every year. To encourage the students to wards science & technology this department arranges a high standard Debate Competition and Extempore Speech for the relevant topic every year for the students of the college. This department mainly caters to the needs of economically disadvantaged students. 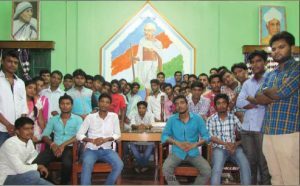 Student’s Union comes forward to help these students with books which they can retain till the completion of their course. Every session many students have been benefited by books from this Aid-Fund.and many ex-students who used to write in this magazine have later emerged as creative writers in their own right. 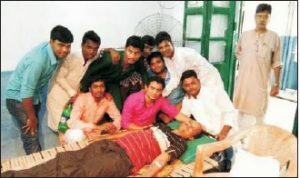 The Blood Donation Camp, organized by the Students’ Union of the College was first held in 1984, the year when Smt. Indira Gandhi, the then Prime Minister of India was assassinated by her security officer. From that point of time the Students’ Union has been organizing the Blood Donation Camp on 28* August every year to fill up the terrible scarcity of blood in the locality and to extend support services to the disadvantaged patients of the community. During more than two decades these camps create a lot of enthusiasm and excitement in the mind of students, faculty and all other stakeholders of the college. 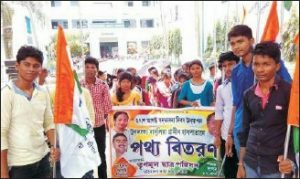 On the “Sadbhawana Divas” (20th August), which is the birthday of Late Rajib Gandhi, the former Prime Minister of India, every year the Students’ Union leads the students of the College to visit the local Hospital (Basulia Rural Hospital) and students distribute fruits among the patients. Every year, just before Puja Vacation, the Students’ Union organizes an educational tour for the students in different parts of India. Last year 72 students of the college went to Rajasthan, Jaypur & Jaisalmer, Bikaner, Sonar Kella and As a result the students get an opportunity for cultural exchange that causes the upliftment of students psychology enjoyed a lot. Rakhi Bandhan Utsav is observed every year in order to develop an integration among students coming from different castes, creed and religion. It also helps develop a sweet relation among the students and the staff. Considering the Socio-economic condition the Students’Union has established a library of its own, for the first time in any college in West Bengal from where the books are borrowed on daily issue basis. We have performed this significant achievement with the grateful support of all teaching, non-teaching staff, students, ex-students and well-wishers of our college. Through this “Union Library”, we want to enrich the creative skill, sound knowledge and academic ability of our students. This library is unique in its own way and caters diverse needs of the students particularly those who hail from financially crippled background. It’s a good news to the students that the college authority has assigned the task of issuing Identity Card on the students’ Union. The students are to submit a preprinted proforma duly filled and with in a very short time they will be supplied with their Identity Card from the union office. Each year the Students Union felicitate the students of the college securing highest marks of the B.A. / B.Sc. / B.Com. (Hons. & Gen.) Final Examination of Vidyasagar University.